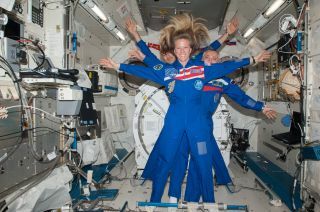 NASA astronaut Karen Nyberg, flight engineer; Russian cosmonaut Fyodor Yurchikhin (center), commander; and European Space Agency astronaut Luca Parmitano, flight engineer, echo Leonardo Da Vinci's famed 'Vitruvian Man' in a crew photo on the International Space Station during the Expedition 37 mission. A Russian Soyuz space capsule will bring the Olympic torch and three residents of the International Space Station back to Earth tonight (Nov. 10) and you can watch the landing live online. The Soyuz TMA-09M spacecraft is due to land on the steppes of Kazakhstan in Central Asia at 9:49 p.m. EST (0249 Nov. 11 GMT) to return NASA astronaut Karen Nyberg, Italian astronaut Luca Parmitano and Russian cosmonaut Fyodor Yurchikhin home after a 5 1/2-month mission in orbit. The trio will also return the Olympic torch to Earth ahead of the 2014 Winter Olympics Games in Sochi, Russia. Russian cosmonaut Fyodor Yurchikhin (center), Expedition 37 commander; along with NASA astronaut Karen Nyberg and European Space Agency astronaut Luca Parmitano pose for a crew portrait while wearing their Russian Sokol spacesuits. The Olympic torch is seen from the helmet camera of Russian cosmonaut Oleg Kotov in this view from a spacewalk on Nov. 9, 2013. Cosmonaut Sergey Ryazanskiy is seen awaiting the torch, which will be used in the 2014 Winter Games in Sochi, Russia. Yurchikhin said he expects to see some emotional moments during the farewell, in addition to the ceremonial passing of the Olympic torch. The torch launched to the space station last week on a Soyuz spacecraft that ferried three new crewmembers to the space station. Two cosmonauts took the Olympic torch on a spacewalk Saturday as part of the relay for the Winter Games. "We have been living here for five and a half months. Each of us, of course, is missing home a lot," Yurchikhin said of the upcoming station departure. "We will have some touching moments. We will be saying farewell to our friends that will be staying on the station." Yurchikhin said he and his crew will hand the Olympic torch over to the Olympic Committee after their return to Earth. The trio launched to the International Space Station in late May and joined three other members of its Expedition 37 crew. During their busy mission, they welcomed a visiting cargo ship from Japan, as well as the first-ever robotic Cygnus spacecraft, a commercial cargo ship built by the U.S. company Orbital Sciences. NASA astronaut Karen Nyberg enjoys the view of Earth from the windows in the Cupola of the International Space Station during her Expedition 37 mission in 2013. Image taken Nov. 4. When the Olympic torch arrived at the station on Thursday (Nov. 7), it was delivered by Russian cosmonaut Mikhail Tyurin, NASA astronaut Rick Mastracchio and Japanese astronaut Koichi Wakata, boosting the station's population to nine people for the first time since 2009. The new trio will remain on the station with NASA astronaut Mike Hopkins and cosmonauts Oleg Kotov and Sergey Ryazanskiy. "These guys are like a group of brothers for me," Nyberg said in a Friday news conference when asked how she felt as the only woman on the crew. "These guys are all great, so it's been fantastic." During her mission, Nyberg embraced social media to share her space voyage with the public. In addition to posting her amazing photos of Earth from space on Twitter, she was the first astronaut to use Pintrest to share her photos and crafts in space. Italian astronaut Luca Parmitano of the European Space Agency plays guitar in weightlessness during his Expedition 37 mission on the International Space Station. Parmitano became Italy's first spacewalker during his two spacewalks, one of which was cut short by a scary water leak in his spacesuit helmet that NASA engineers are still investigating. Still, Parmitano said he would go on a spacewalk again in a heartbeat and will miss living on the space station. "What I am going to miss above everything is the idea of being here, living weightless in this extraordinarily environment," Parmitano said Friday. Visit SPACE.com today for complete coverage of the Olympic torch's return to Earth with Yurchikhin, Nyberg and Parmitano.